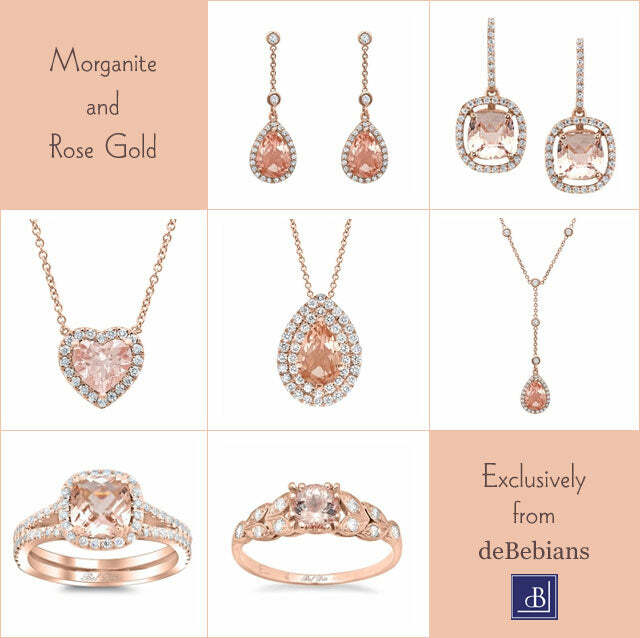 This past week we introduced several new morganite styles, including necklaces, earrings and engagement rings. All are available in 14k rose gold and feature AAA quality morganite and accenting white diamonds. These new designs represent some of our favorite styles, and we hope you like them as much as we do. For earrings, we have two drop earring styles. One features pear shaped morganites in a flush halo setting with a diamond station style chain, featuring bezel set diamonds. The other new earring style features cushion cut morganites in a floating diamond halo, with a delicate thin pave drop. Each earring features a 1.50 ct. morganite, providing a 3.00 cttw in peachy pink morganite. For necklaces, we offer the very sweet heart shaped morganite set in a diamond halo. This is perfect for anyone who loves heart jewelry. It’s very sweet and romantic, and would make a lovely Valentine’s Day gift (it’s never too early to start layaway!). A definite conversation piece is the pear morganite necklace, featuring a double halo of white diamonds. So gorgeous. Lastly is our pear morganite drop necklace, featuring a diamond station chain, which matches perfectly with the aforementioned earrings. A beautiful set that can be purchased together or separately. The newest additions to our collection of morganite engagement rings are this cushion cut morganite engagement ring with a split shank and this nature inspired leaf engagement ring with morganite and diamonds. The cushion cut morganite engagement ring matches well with the cushion cut morganite earrings but is not 100% “matchy matchy,” due to the differing style of the halo: flush vs. floating. The second engagement ring with its Grecian leaf design is a staff favorite, and it’s beautifully styled here in rose gold with morganite.